Fingerprint ID technology on smartphones may already seem old hat to some, but it appears that camera companies are now taking a close look at it for some of their own devices. A recent Canon patent shows a fingerprint sensor not only on the front of a camera body, but also on the side of a lens (marked 46 and 32, respectively, in the diagram below). With photographers’ pricey gear an attractive target for thieves, Canon’s idea of locking up the equipment with fingerprint ID could go some way to discouraging criminals from going after the gear. The ID system could also be set up for several people, allowing the camera to be easily shared among, say, family members. 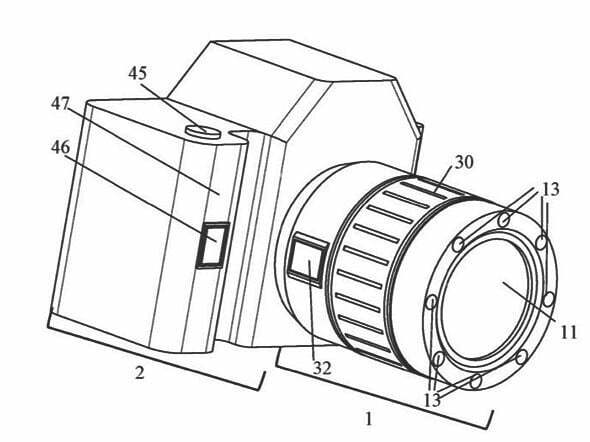 Canon’s patent doesn’t, however, simply stop at security. The document suggests that unlocking the camera could also instantly load up the photographer’s custom presets for elements such as image quality, white balance, and ISO, or perhaps options related to film simulations and other features depending on what the camera offers. It could be possible to create a custom setting for each finger that’s able to easily reach the scanner, which looking at Canon’s design probably means four. It would certainly be a quick and easy way to switch between different setups if you’re the kind of photographer who does that a lot during a shoot. Possible downsides? On the subject of security, it might not work so well for, say, a news photographer who needs to be able to pull their camera from their bag at a moment’s notice if something kicks off without warning. Precious seconds spent unlocking the camera and lens (what if it doesn’t unlock first time because of sweat on your finger?) could cause the photographer to miss the all-important money shot. Having said that, users would probably use the security feature more for when they’re away from their equipment, unlocking it when they leave their home or office so it’s ready to go. It’s worth noting that Canon’s idea exists only as a patent at this stage, so it may never actually show up on any of its camera gear. But it does offer some insight into the kind of technology that the Japanese camera maker may be considering for future models.